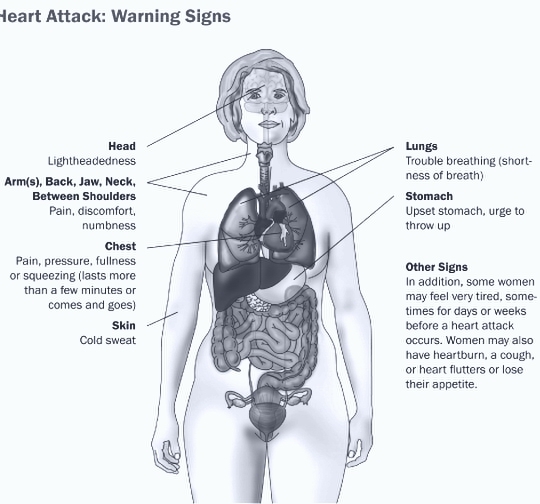 Home / health guide / What are the signs of a heart attack? • Pain or discomfort in the center of the chest. The pain or discomfort can be mild or strong. It can last more than a few minutes, or it can go away and come back. • Shortness of breath (feeling like you can't get enough air). The shortness of breath often occurs before or along with the chest pain or discomfort. • Nausea (feeling sick to your stomach) or vomiting. • Feeling faint or woozy . • Feeling tired or weak. Sometimes the signs of a heart attack happen suddenly, but they can also develop slowly, over hours, days, and even weeks before a heart attack occurs. The more heart attack signs that you have, the more likely it is that you are having a heart attack. Also, if you've already had a heart attack, your symptoms may not be the same for another one. Even if you're not sure you're having a heart attack, you should still have it checked out. If you think you, or someone else, may be having a heart attack, wait no more than a few minutes — five at most — before calling 911.